Members of the Labyrinth Society are encouraged to facilitate group walks at public labyrinths to engage the community and amplify our collective energy. World Labyrinth Day is also a great opportunity to introduce others to the path by organizing lectures, workshops, tours, book readings, art exhibitions, or building temporary or permanent labyrinths. Our 7th annual event is less than three months away! 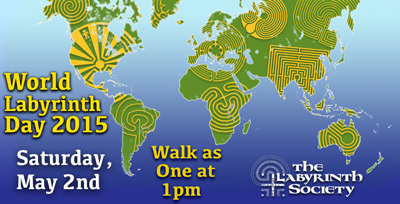 Visit our World Labyrinth Day page for more info! Do you live in a city? Are you aware of Jane's Walk, an international movement that honors visionary urban renewal activist Jane Jacobs by helping communities organise walking tours of their neighborhoods? This annual event takes place the same weekend as WLD. It's an excellent opportunity for community partnering. Contact your local chapter now!